Seahawks kicker Steven Hauschka stayed perfect on the season, but none of last week’s kicks was bigger than the final one. His 45-yard field goal with 3:19 left in overtime helped the Seahawks to a come-from-behind win at Houston, and earned him NFC special teams player of the week honors. He’s a clean 8-of-8 this year, and hasn’t missed from inside 50 yards since the 2011 season. The Seahawks are 4-0 for the first time in franchise history. Sunday’s 23-20 overtime win at Houston marked the end of the first quarter of the season for the Seahawks. And judging by the most important stat — wins and losses — it was the most successful first quarter of a season in team history. Never, since the team began play in 1976, had the Seahawks started 4-0. The road to getting to 4-0, though, was hardly a straight line. Seattle needed somewhat unlikely fourth-quarter comebacks to beat both Carolina and Houston on the road, sandwiching easy home wins over the 49ers and Jaguars. The end of the first four games, though, also marks a good time to hand out a few quarterly grades and awards for the offense, defense and special teams. SPECIAL TEAMS: This area has been an underrated reason for the team’s success. 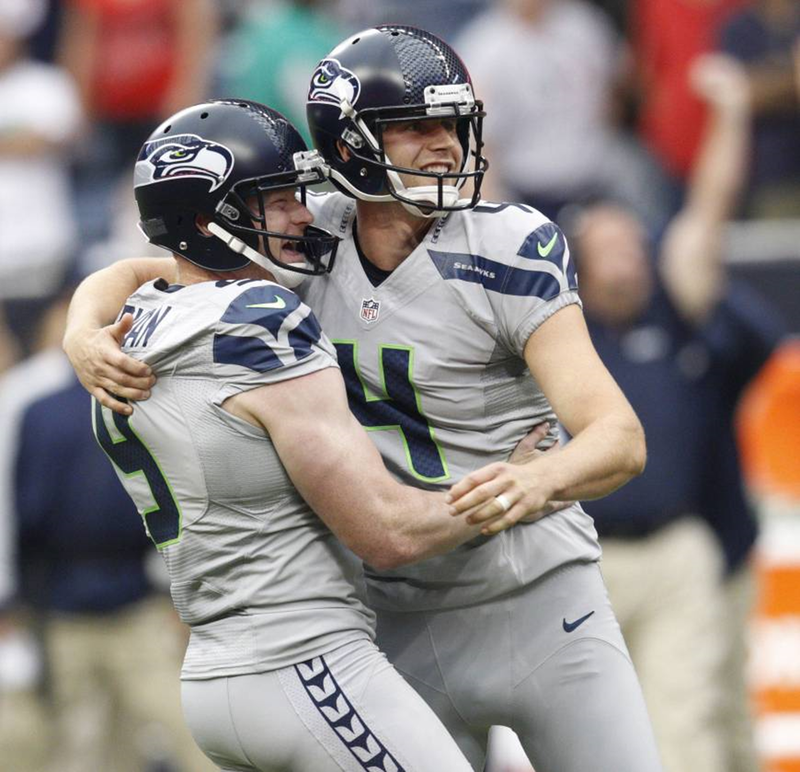 • Kicker Steven Hauschka is 8 of 8, including the 45-yard game-winner last week at Houston. • The coverage has been solid as Seattle has allowed just 8 punt-return yards — least in the NFL — and hasn’t been hurt in the kickoff game (Jeremy Lane has been a quiet standout on those units, leading the team with four special-teams tackles). • And Golden Tate, while sometimes taking angst-inducing risks on punt returns, has statistically been just fine — he ranks fifth in the NFL with an average of 12.3, including his 32-yard return in overtime against Houston that helped set up Seattle’s winning field goal. MVP: Hauschka. He has been perfect and only one kicker has also made eight or more without missing (the Jets’ Nick Folk, also 8 of 8). Hauschka has 18 touchbacks on 24 kickoffs (Seattle’s opponents have had eight touchbacks on 14 kickoffs), a key reason Seattle’s drive start following kickoffs has been 3 yards better than its opponents.